1989 Amada ARIES-245 20-Ton 20-Station CNC Turret Punch Press s/n 24500528 w/ Amada Amadan O4P-A Controls, 20-Station Turret, (2) Indexing Tool Stations, Manual Sheet Repositioner, 36” x 97” Ball-Top Table. 1992 Amada FBD-8025E 80-Ton x 98” CNC Press Brake s/n 8500572 w/ Amada NC9-EX II Controls, 98.4” Table Length, 98.6” Max Bend Length, 86.6” Between Uprights, 15.75” Throat, 3.94” Stroke, 14.57” Open Height. 1989 Amada FBD-8025E 80-Ton x 98” CNC Press Brake s/n 8500308 w/ Amada NC9-EX II Controls, 98.4” Table Length, 98.6” Max Bend Length, 86.6” Between Uprights, 15.75” Throat, 3.94” Stroke, 14.57” Open Height. 1986 Amada FBD-8025E 80-Ton x 98” CNC Press Brake s/n 85000778 w/ Amada NC9-EX II Controls, 98.4” Table Length, 98.6” Max Bend Length, 86.6” Between Uprights, 15.75” Throat, 3.94” Stroke, 14.57” Open Height. 1997 ADRIA QHA-2012 200kN (22 Ton) x 48” Up-Acting Press Brake w/ 49” Table Length, 40” Between Uprights, 26mm to 102mm (.866” to 4.015”) Stroke, 10” Throat (NEEDS SEALS). Pexto mdl. 12-U-52 12GA x 52”Power Shear s/n 736755 w/ Dial Back-Gage, 51” Squaring Arm, Front Material Supports. Haeger 6-Ton x 18” Hardware Insertion Press w/ Haeger Bowl Feeder, Feeder Heads and Acces, Haeger Batch Counter. (3) Haeger 6-Ton x 18” Hardware Insertion Presses. Haeger 2.5 Ton x 12” Hardware Insertion Press w/ Stand. 2001 JITI mdl. MM5210 38” Twin Head Wide Belt Grainer s/n C0602 w/ Belt Feed, Dust Collector. Roto-Finish “Gemini Extended Range Series” 48” Media Tumbler s/n G-700-07-87. Tipton 48” Bowl Style Media Tumbler. Filter King Waste Management System for Media Tumblers. 15” Spot Welder w/ Cooler. Miller Portable Spot Welder w/ Miller Spot Weld Timer and Stand. Import 4-Ton 6” x 6” Hand Corner Notcher w/ Stand. Amada Punch Die Grinder w/ 6” 3-Jaw Chuck, Coolant, Stand. Logan Powermatic mdl. 2257L00H 12” x 32” Lathe s/n 89103 w/ Dial Change RPM, Inch Threading, Tailstock, Tool Post, 6” 3-Jaw Chuck. Rutland Vertical Mill s/n 5782 w/ Newall DRO, Mitutoyo Digital “Z” Scale, 3Hp Motor, 70-4200 Dial Change RPM, Chrome Ways, 9” x 42” Table. 2013 Kaeser Air Center SM15 15Hp Rotary Air Compressor s/n 1246 w/ Kaeser Sigma Controls, Built-In Refrigerated Air Dryer and Tank, 53 CFM @ 125 PSIG, 10,245 Metered Hours. Dayton 18” Vertical Band Saw w/ 18” x 18” Table. Skil 9” Vertical Band Saw. (2) Ryobi 14” Abrasive Cutoff Saws. Central Machinery 6” Belt / 9” Disc Sander w/ Stand. 60 Gallon Air Storage Tank. Custom 3-Head Automatic Drilling / Tapping Machine w/ (3) Central Machinery 8” Drill Presses, Table. Lincoln Squarewave TIG 175 AC/DC Squarewave TIG Welding Power Source s/n 10265-U1980708906. 5’ x 6’ Steel Welding Table. Mitsubishi FGC18K 6600 Lb Cap LPG \ Forklift s/n AF81D00148 w/ 3-Stage Mast, 220” Lift Height, Side-Shift, Cushion Tires. 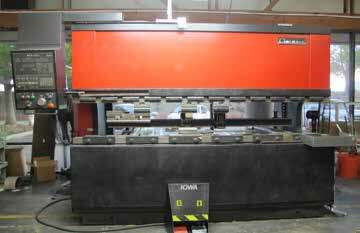 Amada Press Brake Dies and Racks. (5) Kurt 6” Angle-Lock Vises.